Rattner, who spoke with PodTech’s Michael Johnson to give a preview of the Fall IDF, wrapped up the annual developer conference by acknowledging Wired Magazine’s prediction that, as social media and user-generated content hit the mainstream at the same time as the rise of broadband and increased connectivity (and mobility), the coming year could see 60 million participants in online virtual worlds. 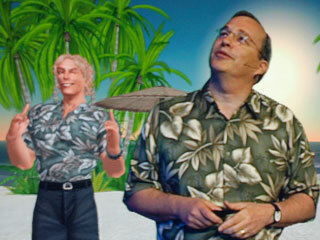 Rattner was also joined onstage by Greg Nuyens, CEO of Qwaq, who demoed virtual worlds for the enterprise. Outside of business applications, virtual surgery (especially as a training tool) suggests that realistic virtual environments are already a significant force in some communities. The larger message that Rattner left the crowd with was that the computing power that will be necessary to deliver this rich 3-D experience will have to be substantial, especially given the demand that real time or “frame rate” visual experience for the 3D Web will demand.